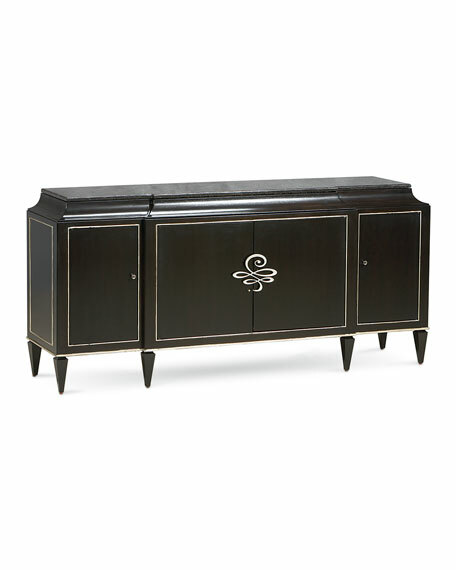 This is an elegant closed storage piece that compliments dining tables or serves as a focal point in a living room or large foyer. Take note of our beautiful Almost Black finish that allows the wood grain to shine through. The custom-designed hardware is a signature element of this piece and has a soft, warm silver finish. 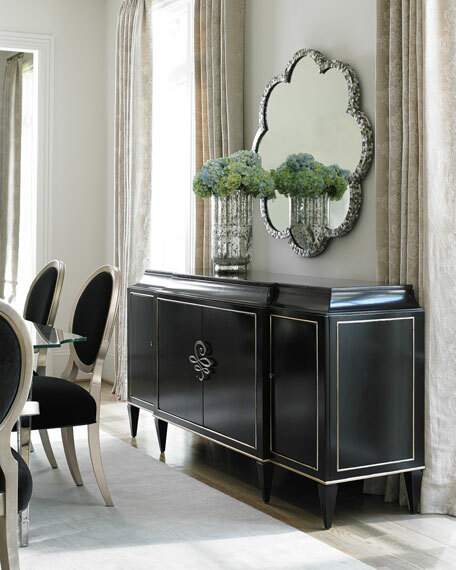 Rive Gauche also boasts a secret drawer in the top center and is opened with a conspicuous touch latch, making it a great place to store your flatware with ample space below for your favorite entertaining items. Behind the left and right doors are four drawers with removable wine bottle storage. Handcrafted buffet with black granite stone top. Hardwood solids and maple veneers. Four doors total; one secret drawer at top. Opening without shelf: 38.5"W x 15.5"D x 17"H.
Overall: 78"W x 20"D x 36"T.
Boxed weight, approximately 352.7 lbs.